"A law firm had a disqualifying conflict of interest in representing both the plaintiff in civil racketeering litigation and a criminal defendant who pleaded guilty in the scheme, the U.S. District Court for the Central District of California said June 24 (State Comp. Ins. Fund v. Drobot, 2016 BL 205454, C.D. Cal., No. SACV 13-0956 AG (JCGx), 6/24/16 )." "Judge Andrew J. Guilford stuck by his decision earlier this year to disqualify Hueston Hennigan LLP as counsel for State Compensation Insurance Fund (SCIF) in the sprawling civil litigation. The civil and criminal cases are one and the same for conflicts purposes, and the clients' dueling interests would mangle the firm's loyalties too severely for informed consent to fix the conflict, Guilford found." "The decision casts doubt on whether lawyers can rely on waivers to legitimize concurrent representation of clients with adverse interests in overlapping criminal and civil proceedings. The court's restrictive stance on the question of waivability will be especially alarming to large firms that see conflict waivers as a key risk management tool." "Guilford found it unnecessary to decide here whether a firm's representation of adversaries must be in the same ‘lawsuit,’ the same ‘litigation’ or the same ‘matter’ in order for the conflict to be deemed unwaivable." "The firm pointed out that SCIF had executed four separate conflict waivers specific to the firm's concurrent representation of Randall in the criminal matter... Guilford combed through Randall's three waivers and SCIF's four waivers, and found them ineffective. The waivers at times incorrectly described the criminal and civil proceedings as ‘unrelated,’ and large portions of the waivers amounted to boilerplate without much substantive meat, Guilford said. The waivers also contradicted one another and contained questionable terms, he said." "Guilford contrasted these waivers with a conflict waiver that he found sufficient in another case. See United States v. DeCinces, No. SACR 12-0269-AB, Dkt. 441 (C.D. Cal. July 21, 2015). That waiver was the “gold standard” for effective informed consent, he said." "As more attorneys run conflicts before opening a new matter and take advantage of available technology, attorneys and law firms are getting better at identifying potential conflicts of interest that could impact a matter. But identifying that there could be a conflict is only the first step. Many attorneys ask themselves, 'What next?'" "Likewise, it usually is not sufficient just to ask for a client's waiver of the conflict or consent to the representation. An effective disclosure typically requires more. In the context of conflicts of interest, Rule 3-310 of the California Rules of Professional Conduct defines disclosure as 'informing the client or former client of the relevant circumstances and of the actual and reasonably foreseeable adverse consequences to the client or former client.'" "In general terms, the professional rules call for an attorney to disclose whatever information a reasonable person would expect and need to consider before waiving an important right, and then to confirm that consent in writing. That written consent is often referred to as a "waiver." In specific terms, there are topics that some attorneys typically include when seeking a client's consent or waiver." "First, in reviewing conflicts, many attorneys identify the proposed representation and what consent is sought from the client. 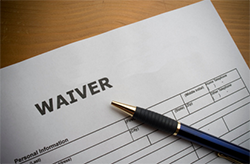 "General" waivers typically call for a different kind of disclosure than a "limited" waiver for a specific representation. Therefore, tailoring the requisite full disclosure often involves making clear exactly which kind of waiver the attorney seeks." "In the multiple representation context, this often means advising the client that the attorney is requesting permission to jointly represent the client along with others. In the successive representations context, this generally means advising a former client that the attorney is requesting permission to represent a new client in a matter involving the former client."